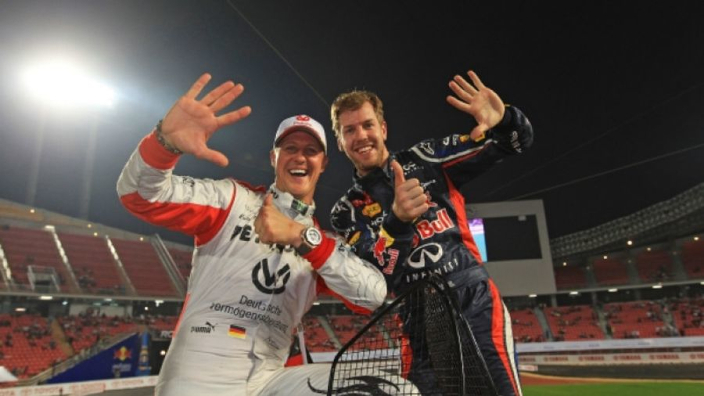 Sebastian Vettel has confessed that he would certainly have taken up the opportunity to seek his mentor and friend, Michael Schumacher, for advice this season as he languishes 40 points behind his rival, Lewis Hamilton, in the F1 drivers' championship standings. Schumacher is currently on the long road to recovery from a life-threatening accident a few years ago which saw him suffer brain injuries whilst skiing. A medically-induced coma helped save his life, and since then the Formula One legend has been recovering at home with his family. News regarding his health has been scarce as his family remain private about the circumstances surrounding his state, but the very latest reports suggest he is still struggling to talk or speak. Schumacher is a friend of Vettel, with the duo both hailing from Germany, and the Ferrari star had admitted he misses the opportunity to see his old mentor for advice. Mika Hakkinen, in his column for Unibet, writes that Vettel would have benefited from Schumacher's guidance, particularly in this season when he has suffered from "many mistakes and strange decisions". “I have seen that Sebastian has said he wishes he had Michael Schumacher available to ask for advice, and I can understand why,” the Finn wrote. “Working very closely with the management and senior technical staff, Michael knew how to help get the most out of the Ferrari team. And it looks like Vettel has lost some faith in the team to provide him with the necessary support." MORE: Hamilton v Vettel: Who is favourite at the remaining races in 2018?